* Not the actual twist ending. "We're sorry, but the number you have dialed has been disconnected or out of service since before this comic even started, thereby making this call a terrifying twist ending. Please hang up now." — Name Removed, "Suspicious Salesman (foists Faustian fraud)"
It's the oldest trick in the book, really. The plot leads toward an inevitable conclusion, then, at the last possible minute, we throw something in that changes everything. It looks like the cops have an open and shut case against the Scary Minority Suspect, but then, BAM, a crucial piece of evidence turns up to set them straight. It looks like our heroes are totally boned, then BAM, the Forgotten Superweapon or The Cavalry turns up. It looks like our Dom Com family has finally hit it big and won the lottery then BAM, the ticket gets eaten. Common across all genres, though really spectacular twists tend to be the domain of Speculative Fiction and Crime And Punishment. The Twist Ending started life as a good thing. Really, the twist ending is the original Subverted Trope: you set the viewer up for one thing, then pull the rug out from under them. The problem is, after a certain point, the opposite of a trope becomes a Dead Horse Trope itself. In a normal series, you know that they can't go around undermining the entire premise, so when it looks like it's going that way, you already know there's going to be a twist ending. In an anthology, you're no better off, because, well, every single episode of The Twilight Zone ends on a twist, so it's not like it's unexpected, it practically becomes a Mandatory Twist Ending. In terms of cinema, directors like M. Night Shyamalan are the constant subject of criticism for continuous use of the twist element. Once the audience know the twists are coming sooner or later, works can't help but lose some of their potency. Predictably, the twist will doubtless leave audiences mystified and feeling cheated. The other problem with the Twist Ending is that it walks a mighty fine line: if it's too in-keeping with the direction of the story, it doesn't qualify as a twist. If it's too far out-of-keeping, it comes off as a Deus or Diabolus ex Machina and the viewer feels cheated. At its worst, it can end up being a Shocking Swerve, just a off the wall twist for the sake of "fooling" the audience, attempting to create excitement simply by nonsense happening. The Twist Ending is the usual way of implementing a Reset Button, a Your Princess Is in Another Castle! moment, or ensuring that Failure Is the Only Option. In Science Fiction, the Twist Ending is often a Tomato Surprise. This is also sometimes the case in the more hackneyed mystery shows. This trope is particularly prevalent in Asian horror films. 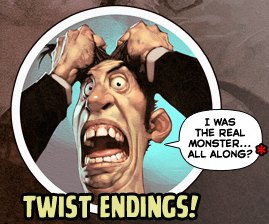 A literature-exclusive variant called the Snap Ending can be found in some horror stories. In the Snap Ending, the twist is delivered in the very last line of the story. Not to be confused with Tragedy. Subtrope of Plot Twist. Also see Movie Twist List, It Was His Sled. Contrast The Un-Twist, Meta Twist and The Ending Changes Everything. A twist that doesn't make sense may qualify as a Shocking Swerve. A good twist that sets up the rest of a still-extant work is generally referred to as a Wham Episode, even if it doesn't actually refer exclusively to specific serials of television. All of these tropes are Spoilered Rotten to one degree or another, as they are a subset of Ending Tropes.